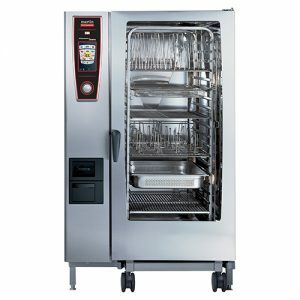 An essential piece of catering equipment in any commercial kitchen is a good combi oven. Combi ovens cook with moist heat, dry heat or a combination of both modes for the best cooking results. The Martin Food Equipment ‘Self Cooking Centre’ powered by Rational is hugely versatile and has been matched to all types of businesses including convenience retailers, bakeries, restaurants, hotels, cafes and even butchers! Martin Food Equipment combi ovens are fully automatic and programmable, ensuring food is cooked to perfection every time, exactly how you want it. The ‘Self Cooking Centre’ has a stunning LED lit interior to provide theatre for front of house cooking. A new energy consumption display shows just how little energy this technologically advanced oven consumes. With the ‘Self Cooking Centre‘, retailers and caterers can cook an array of different products at the same time. The oven informs the operator when each product is ready, enabling fast product production for increased turnover and superior profits.The intelligent ‘Self Cooking Controls’ recognises product specific cooking needs and checks and regulates the progress of cooking. 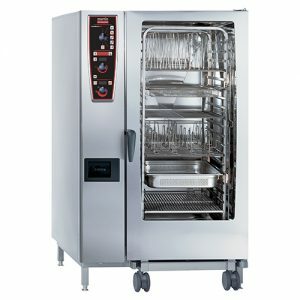 The ‘Self Cooking Centre‘ is easy to use with exceptional results.Martin Food Equipment has matched the right combi oven to thousands of different businesses over the years, ensuring each businesses unique cooking and serving needs are met. The superb technology of a Martin Food Equipment ‘Self Cooking Centre’ combi, powered by Rational, means the oven cabinet humidity is measured throughout the cooking process, then adjusts and maintains automatically to the levels needed. The unique cooking performance of a Martin Food Equipment Self Cooking Centre combi guarantees outstanding cooking quality for any load size. Maximum cooking efficiency compared with conventional combi-steamers allows load sizes to increase by 30% with up to 30% time saving in production and 20% in lower energy consumption. The Self Cooking Centre will save money on labour and energy, adding to bottom line profits.